Daguerre, Louis-Jacques-Mande (1787-1851), a French artist and physicist. He was born on November 18 in 1787 in Cormay near Paris (France). He began his career working in the department of government fees, and then he became artist and scene-designer in a theatre. He helped Pier Prevos in creating panorama pictures, and in 1822 he created the first diorama in a special pavilion in Paris. The inventor built the same diorama in London as well. Daguerre was making experiments for a long time, aspiring to lighten reproducing of images in his diorama, and together with Joseph Nicephore Niepce (1765-1833), who was working since 1814 in this sphere, he developed the procedure of obtaining a non-disappearing image with the help of light. In 1833 Niepce died, and Daguerre suspended the development, started together, for some time, but in 1839 he announced about the invention of a new process, which he named daguerrotypy. The image was obtained by means of exposition of a plate, coated with a layer of silver iodide, in the sunlight, and then it was fixed with mercury fumes and natrium hyposulfite. 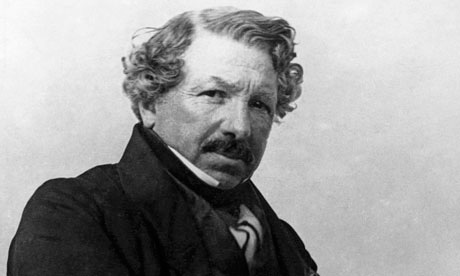 Daguerre died in Brie-sur-Marne on July 10, 1851.